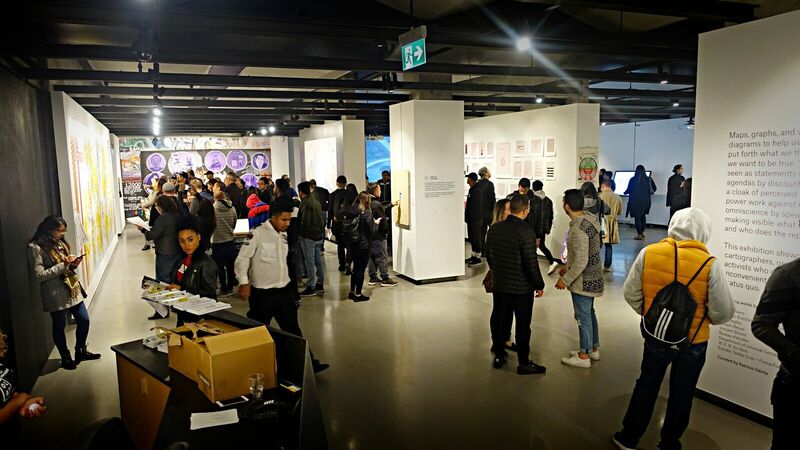 Record crowds visited OCAD U during Nuit Blanche 2018 to view FORWARD, an immersive digital work by Daniel Iregui and a group exhibition, Diagrams of Power, at Onsite Gallery. More than 14,500 visitors came through the doors of 100 McCaul St. to view FORWARD, an installation of two “tunnels” that generate infinite ways to get to a distant point on the horizon. Curated by Linda Columbus, Programs Coordinator, Onsite Gallery, the work was created by Daniel Iregui, a new media artist who creates interactive sculptures, spaces and architectural interventions using technology as a tool and an aesthetic. Onsite Gallery attracted close to 6,000 visitors for its Diagrams of Power exhibition, which ran from July 11 to September 29, 2018. Curated by Patricio Dávila, Associate Professor, Faculty of Design, OCAD University, the exhibition showcased art and design works using data, diagrams, maps and visualizations as ways of challenging dominant narratives and supporting the resilience of marginalized communities. Join Brendan Fernandes and Harold Offeh as they delve into the stories behind their projects that focus on queer identity, pride and presence. Both artists work across a range of media including performance and social practice. The discussion will explore the connections between Fernandes’ ongoing investigations of queer bodies and dance as an act of resistance and Offeh's interest in creating spaces from which to explore the relationship between race, identity and the body. OCAD University will feature an immersive digital work by Daniel Iregui at 100 McCaul St. and Onsite Gallery, located at 199 Richmond St. W., the university’s flagship professional and public gallery, will be open all night for Nuit Blanche 2018. FORWARD is an installation of two “tunnels” that generate infinite ways to get to a distant point on the horizon. The work alludes to the future becoming the present, and disappearing. The viewer travels through endless visual tunnels, evoking a feeling of forever propelling forward. Yet, tethered by the physical body, a conflicting sensation of remaining static in the present will remind viewers that: you are “here”. Now. FORWARD is a sensory experience of sight and sound that intimates that the present is always only an effervescent instant. Daniel Iregui (iregular.io) is a new media artist who creates interactive sculptures, spaces and architectural interventions using technology as a tool and an aesthetic. He works with the infinite and random combinations produced when an audiovisual system is open for the audience to transform it. In 2010 Daniel founded Iregular, an interactive content creation studio where he produces his work and commercial commissions. He was born in Bogotá, Colombia in 1981 and currently lives and works from Montréal. At 199 Richmond St. W.
Group exhibition featuring work by Joshua Akers, The Anti-Eviction Mapping Project, Josh Begley, Joseph Beuys, Vincent Brown, Bureau d'études, DataMade, Department of Unusual Certainties, W. E. B. Du Bois, Estudio Teddy Cruz + Fonna Forman, Forensic Architecture, Iconoclasistas, Julie Mehretu, Lize Mogel, Margaret Pearce, Philippe Rekacewicz, Visualizing Impact, and more. Diagrams of Power showcases art and design works that use data, diagrams, maps and visualizations as ways of challenging dominant narratives and supporting the resilience of marginalized communities. Image credit: Installation view: Daniel Iregui, FORWARD, 2015. Two-channel installation. OCAD University is proud to be participating once again in Nuit Blanche Toronto 2017 as a Major Institution. This year’s Nuit Blanche program at OCAD U sprawls across the university’s expanded campus. To facilitate Nuit Blanche activities, 100 McCaul St. and 205 Richmond St. W. buildings will close at 5 p.m. on Saturday, September 30. All buildings will re-open at 12 noon on Sunday, October 1. For the duration of Nuit Blanche, there will be no swipe card access. All spaces other than those used for Nuit Blanche activities will be closed, including all personal offices and access to lockers.